Along with the launch of the two Skylake-K processors today, we also have a raft of new motherboards to go with them. 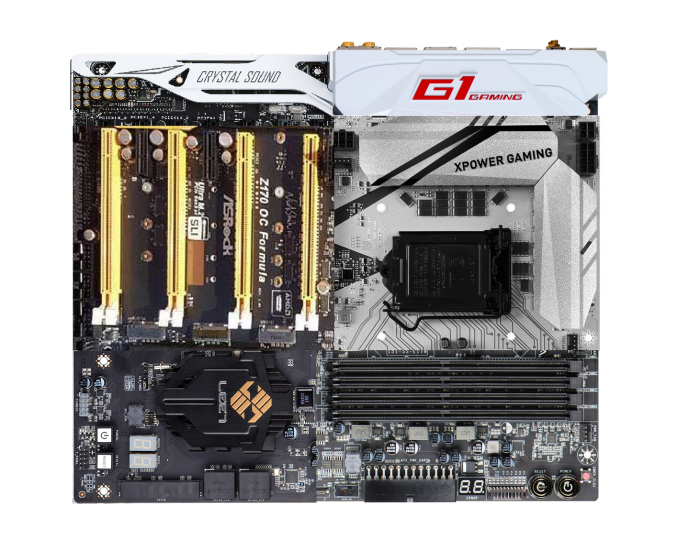 The Skylake processors use the LGA 1151 socket (which is new) combined with the Z170 chipset, meaning every motherboard manufacturer has been developing and putting together a whole stack of products to meet different price points and demand. The Z170 chipset itself represents a large jump in terms of IO design, driven by the growing need for diversification and utility on modern platforms. In this piece we are going to look at both the Z170 chipset itself, the benefits that come along with using Z170, and then the motherboards that are set to launch equipped with it. Intel’s details about the chipset have been some of the briefest we have experienced in any recent Intel launch, although we have been able to piece together various aspects of the design from a number of sources. We have been promised more detail about the system during the Intel Developer Forum in mid-August, to which both Ryan and I will be attending and asking plenty of questions. A lot of the detail about Z170 in this piece is mirrored in our main Skylake review as well. For the motherboard information itself, this is the culmination of requests to the manufacturers who have mostly provided both pictures and specifications on the bulk of their ranges. Due to this launch being a couple of weeks earlier than the motherboard manufacturers expected (even from Computex), not everything is 100% ready to go today - as a result we are still awaiting MSRP details for a lot of the products, but they should be on the shelves if not today then in the next couple of weeks. So to clear up any pre-release ‘leaks’ or guesses as to the configuration of the platform, we have sixteen PCIe 3.0 lanes coming from the processor which can be split into an x16, x8/x8 or x8/x4/x4 configuration. Motherboards that have x8/x4/x4 will only support dual-SLI in x8/x8 mode when the final x4 is unpopulated due to limitations placed on SLI by NVIDIA. The processor will support both DDR4 and DDR3L, whereby DDR3L is the 1.35 volt standard of DDR3 – no regular 1.5 volt DDR3 kits will be expected to work due to the high voltage. Motherboard manufacturers can choose to support DDR4, DDR3L, or a mixture of these two technologies. That being said we see DDR3L being used only on low-to-mid range products with the emphasis being placed on DDR4. The integrated graphics for the CPU is called Intel HD Graphics 530, which deviates from previous version of Intel’s naming scheme. Intel states that its 6th generation processor (Skylake) integrated graphics will use this new 3-digit naming scheme to reduce confusion. The HD Graphics 530, on both the i7-6700K and i7-6600K processors, is Intel’s GT2 variant of the Generation 9 graphics architecture with OpenCL 2.0 support and 24 Execution Units (EUs) running at a peak of 1150 MHz. Please refer to the main CPU article for more information. The processor is connected to the chipset by the four-lane DMI 3.0 interface. The DMI 3.0 protocol is an upgrade over the previous generation which used DMI 2.0 – this upgrade boosts the speed from 5.0 GT/s to 8.0 GT/s, but requires the motherboard traces between the CPU and chipset to be closer (7 inches rather than 8 inches) in order to maintain signal speed and integrity. This also allows one of the biggest upgrades to the system, chipset connectivity. For each of the 26 high-speed input/output ports (HSIO, or the Flex-IO), there can be a variety of combinations available. Each manufacturer can run down the list and apply what they may or may not need – some of the extra functionality (e.g. GbE / Ethernet) will require extra controllers. By default, the first six HSIO ports are USB 3.0, with two able for super-speed interconnect where warranted. The next 20 HSIO ports are split into groups of four PCIe 3.0 lanes, such that each group is part of one of the internal controllers on the chipset. The HSIO allows a smörgåsbord of options, a variable pick-and-mix. 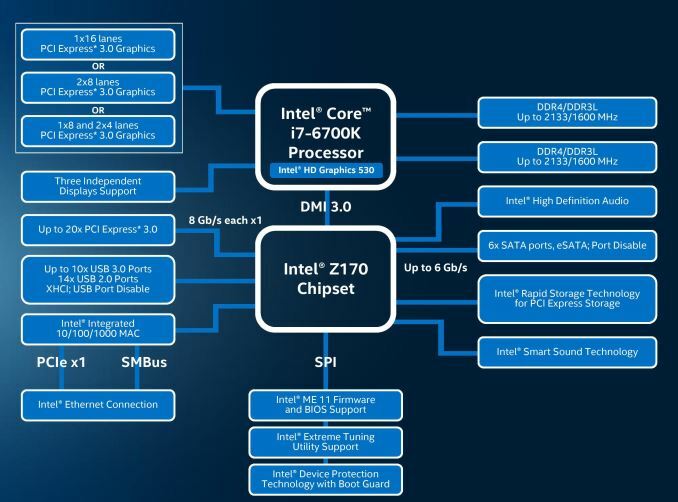 The last three sets of four are also labelled Intel PCIe storage device – this is important because the new Z170 chipset now supports more PCIe devices as part of its Rapid Storage Technology (RST). 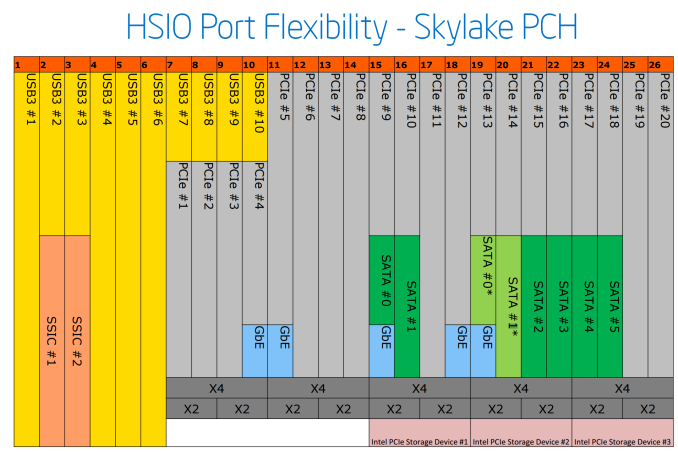 This allows M.2 and SATA Express devices to be in RAID arrays as long as they are connected through these HSIO lanes. The new version of RST is given the number 14, and RST 14 supports three PCIe devices at one time. As a result, we will probably see motherboards with three M.2 slots all in PCIe 3.0 x4 mode, available for RAID. With that being said, we lose any extra SATA ports and have to rely on controllers elsewhere to do everything else. It is worth noting that the constant SATA ports on Z170 support DEVSLP modes. There will be several companion controllers to look out for on the Z170 motherboards. The most common we expect to see is the ASMedia ASM1142 controller, which is used to provide USB 3.1 Gen 2 ports. This controller uses two PCIe lanes to provide up to two USB 3.1 ports. This controller uses two PCIe lanes to provide up to two USB 3.1 ports, typically on the rear panel. We have reviewed this implementation on previous chipsets here and here. Typically the presence of the ASM1142 controller will increase the price of the motherboard by a small number of dollars – I suspect motherboard manufacturers are buying this in bulk for a number of future devices. 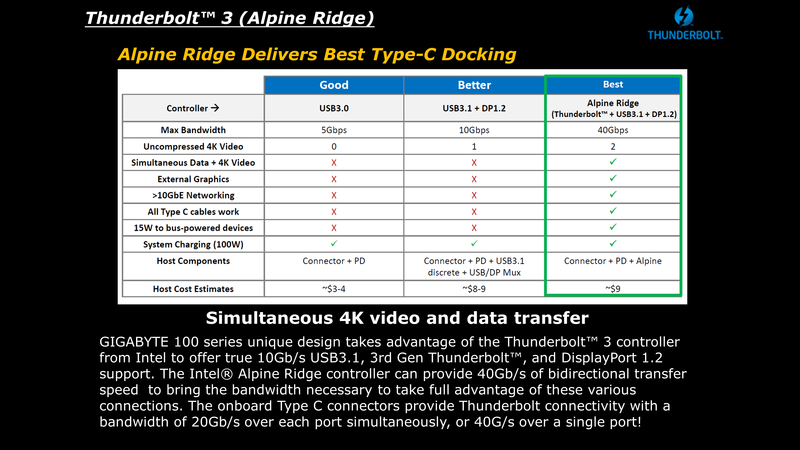 The other way to place USB 3.1 on the motherboard is through Intel’s Alpine Ridge Thunderbolt controller. Using four PCIe lanes (and the DisplayPort lanes), the Alpine Ridge controller can support USB 3.1 Gen 2, Thunderbolt 3, and DisplayPort, and all over the USB Type-C connector as necessary. Alpine Ridge can also act as a LS-Pcon and convert the DP signal into a HDMI 2.0 signal with HDCP 2.2 support. 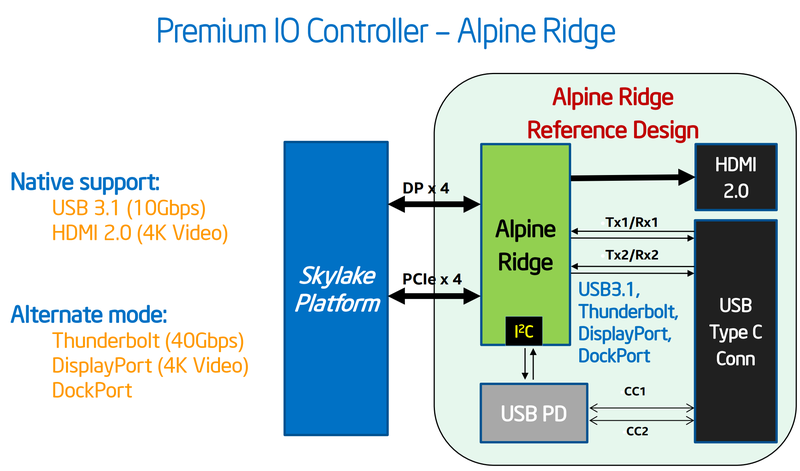 As mentioned in GIGABYTE’s details above, the Alpine Ridge solution will add around $10 to the cost of the board, which probably translates near $20 to the end-user cost. It is our understanding that the increased speed of the Z170 launch means that there has been supply issues with Alpine Ridge controllers and that there will be more products coming out next month (September) from various manufacturers that will use the controller. 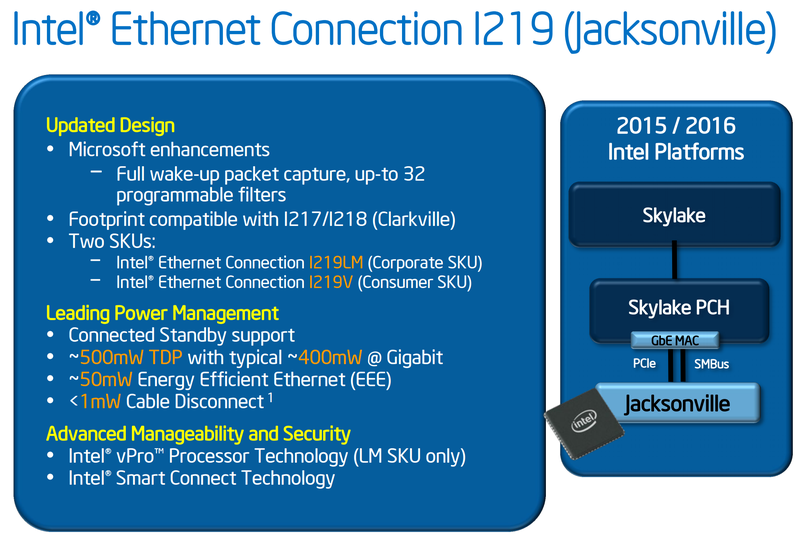 The final controller we will see a lot of is Intel’s own gigabit Ethernet family, the I219 controller, named Jacksonville. As mentioned above, the I219-V is aimed at consumers while the I219-LM is for corporate/business although I imagine we will see a mix of both on a number of motherboards, especially at the high end. The I219 series comes with better power management, so when Skylake comes to more power-conscious platforms we should see some uptake there. I will also add that Realtek Ethernet solutions will also be seen on Z170 motherboards, typically as the cost effective solution. Back at Computex we also saw Realtek’s gaming network solution, the Dragon, with the codename 8118AS on some ECS models. Opposite that will be the Rivet Network’s Killer Ethernet controllers, specifically the E2400, as a gaming optimized model along with the marketing points that go along with it. Moving on to power arrangements on Z170 motherboards, with Skylake the situation changes as compared to Haswell. Prior to Haswell, voltage regulation was performed by the motherboard and the right voltages were then put into the processor. 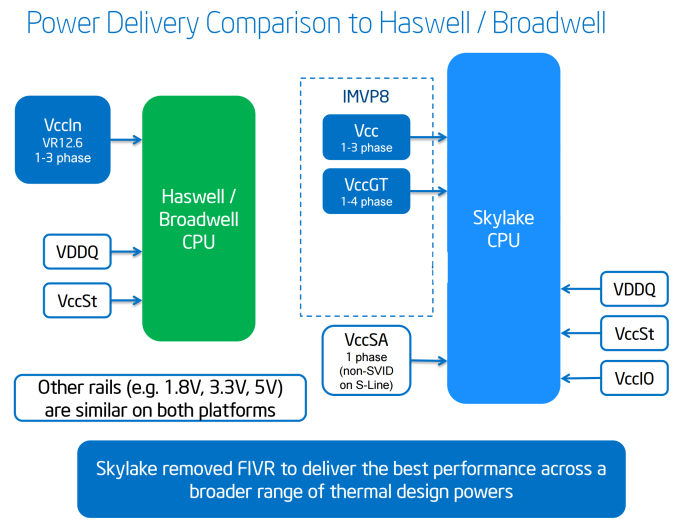 This was deemed inefficient for power consumption, and for the Haswell/Broadwell processors Intel decided to create a fully integrated voltage regulator (FIVR) in order to reduce motherboard cost and reduce power consumption. This had an unintended side-effect – while it was more efficient (good for mobile platforms), it also acted as a source of heat generation inside the CPU with high frequencies. As a result, overclocking was limited by temperatures and the quality of the FIVR led to a large variation in results. For Skylake on the desktop, the voltage regulation is moved back into the hands of the motherboard manufacturers. This should allow for cooler processors depending on how the silicon works, but it will result in slightly more expensive motherboards. A slight indication of this will be that some motherboards will go back to having a large amount of multiplexed phases on the motherboard, and it will allow some manufacturers to use this as a differentiating point, although the usefulness of such a design is sometimes questionable. There are some more esoteric properties of the Z170 chipset worth mentioning – the ball pitch of the grid array attaching the chipset to the motherboard has decreased from Z97, from 0.65mm to 0.50mm. The chipset now supports DMIC, digital microphone direct attach, allowing microphones to be plugged directly into the chipset without the need for an external codec. This has benefits in power saving (no need to activate an external codec) and potential cost savings (don’t buy an audio codec), specifically for features such as Wake-On-Voice. The analog (VGA) video connector has now been completely removed from the CPU/chipset combination, meaning that any VGA/D-Sub video connection has to be provided via an active digital/analog converter chip. 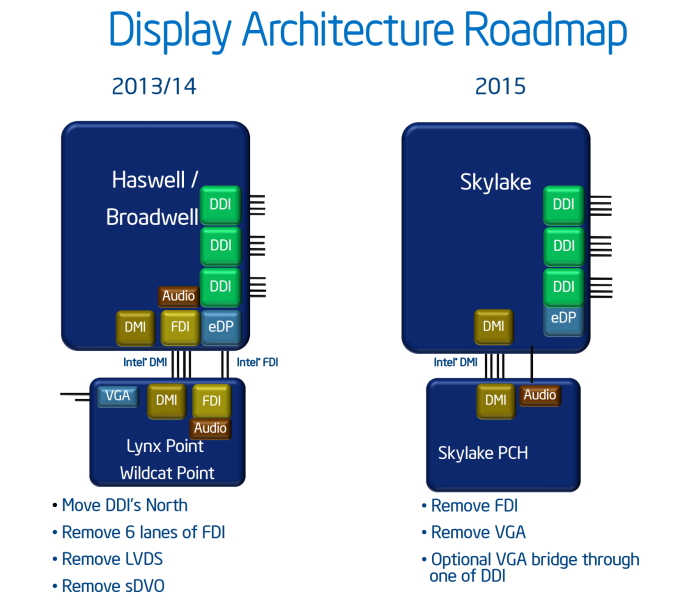 This has been a long time coming, and is part of a previous committment made by Intel several years ago to remove VGA by 2015. Removing analog display functionality will mean added cost for legacy support in order to drive analog displays. Arguably this doesn’t mean much for Z170 as the high end platform is typically used with a discrete graphics card that has HDMI or DisplayPort, but we will see motherboards with VGA equipped in order to satisfy some regional markets with specific requirements. 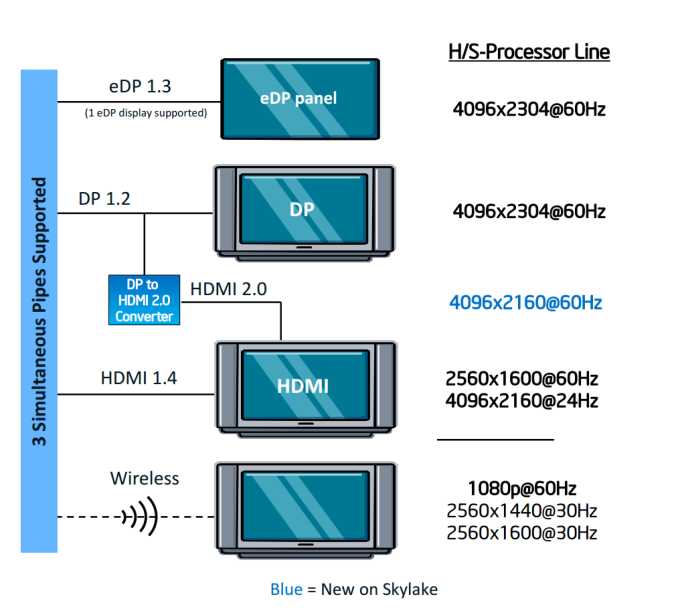 A DP to HDMI 2.0 converter, specifically an LS-Pcon, is required to do the adjustments. We suspect that there will not be many takers buying a controller to do this, given the capabilities and added benefits of the Alpine Ridge controller. The power into the chipset is now provided by a single power rail, rather than separate core/suspend rails, which should simplify design. Some other restrictions are also placed on PCIe routing signals, bringing the maximum length down from 10-inches to 9-inches, and also M.2 routing in PCIe 3.0 mode is also reduced. We are also informed that PCIe flex cable/daughter card arrangements are limited to PCIe 2.0 mode. One big shock will be for Windows 7 users. 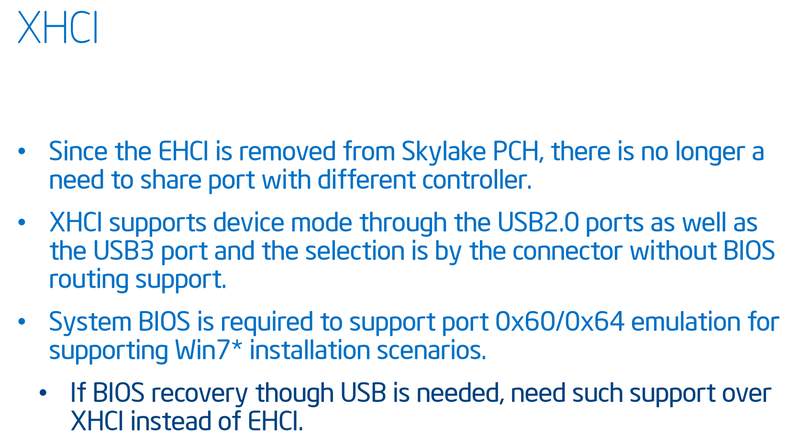 By default, the Z170 chipset and BIOS will not support full USB 2.0 Enhanced Host Controller (EHCI) mode. 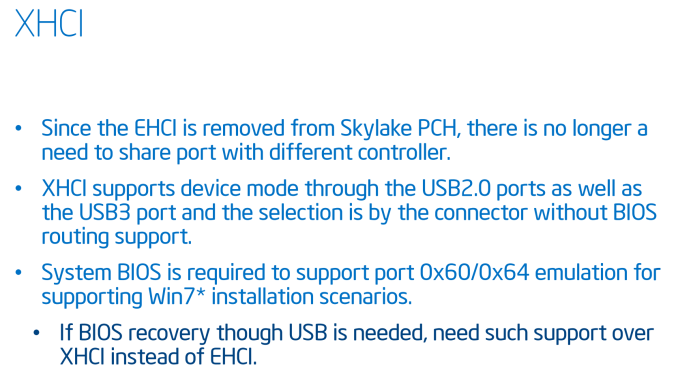 This means that for a number of circumstances, USB devices will not work unless an XHCI environment in play. Enable ‘Windows 7 Installation’ or ‘EHCI mode’, Save and Exit. Have your Windows 7 image on an optical disk. USB sticks will not work! Install the OS as normal via the optical media. Install OS drivers/USB 3.0 drivers. This is done for a couple of reasons. Firstly, it helps reduce the size of the BIOS for more customization. It also aids moving users to AHCI capable operating system installations. For everyone else, it is a bit of a headache. As far as we can tell, almost all motherboard manufacturers (at least the Tier-1s) will have this option in the BIOS to enable Windows 7 installation. Z170 and the Skylake platform make a large number of fundamental changes when it comes to functionality, design and cost. By opening up the chipset HSIO/Flex-IO ports to twenty PCIe 3.0 lanes, even with specific limitations on a number of them, we should avoid the situation we had in Z97 where users might have three features but only two of them would work at once. Now we have enough lanes to enable them all. From a personal perspective, this allows for several esoteric designs. Because the chipset is limited as a maximum to PCIe 3.0 x4 per port, imagine the system having several quad-lane SATA controllers, each giving out eight SATA 6 Gbps ports. Combining those with port multipliers might allow each controller to double its ports. That means five controllers, each with eight SATA 6 Gbps ports, then doubled with port multipliers. A motherboard with 80 SATA ports, anyone? Perhaps I jest, but the limitation of what can be done now revolves around the imagination of the motherboard manufacturers and how much of a market is out there. They are all listening to what the customers want, and the more you want to buy the more of a say you can have. Leave interesting suggestions and combinations below. For users waiting on other chipsets than Z170, such as H170, Q150, B150 and H110 will have to wait until later in the year when Intel releases them. At this time, only Z170 is being launched. A Small Bit of Confusing Terminology: USB 3.1 Gen 1 or Gen 2? Finally, to throw a bit of a curveball in here, you will see motherboard manufacturers refer to USB 3.1 in different ways. Specifically, some manufacturers will refer to the new USB 3.1 ports as ‘USB 3.1 Gen 2’, giving 10 Gbps bandwidth, and the older USB 3.0 ports as ‘USB 3.1 Gen 1’ for 5 Gbps bandwidth. This just makes everything confusing for the buyer, and we aren't fond of these shenanigans. Although both Apple and MSI are using the Gen1/Gen2 terminology, we will keep it simple.